SARATOGA SPRINGS – Brad Paisley is into two things: having fun and playing guitar. 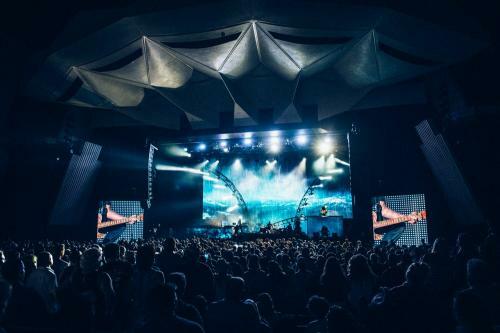 If his set Sunday night at SPAC showed anything, it’s that he excels at both, serving up ample amounts of lighthearted entertainment and guitar pyrotechnics over the course of nearly two hours. After opening with a few songs off his recent album “Moonshine in the Trunk,” Paisley played the track “Celebrity.” As a mascot wearing a giant cloth Paisley head roamed the stage, a bartender served drinks on-stage to nine lucky fans as a video of the Paisley mascot run amok played and the real Paisley shredded on guitar. After playing the intro to “This is Country Music” on his acoustic, he took it off, autographed it and gave it to twin boys in the front row, joking that the two would later fight over it “like King Solomon.” The fun and games (and Paisley’s abiding love of silly videos) continued during “I’m Still a Guy,” performed as a duet with opener Justin Moore and ending in a mock game of the Nintendo classic “Duck Hunt” on the video screen behind the band. While Paisley often joked with the audience via the videos on the screen, when it came to guitar he was serious. The ballad “She is Everything” featured two monstrous solos showcasing his swift, deft fretwork and finger-picking skills. This nifty lead work continued through fun country-rockers “Ticks” and “American Saturday Night” and forgettable mid-tempo cuts “Beat This Summer” and “Perfect Storm.” It culminated in the driving Southern rocker, “Old Alabama,” featuring a pre-taped performance from the ‘70s rock group Alabama and frantic outro reminiscent of the Charlie Daniels Band at its finest. The pre-taped performance made another appearance in the evening. After taking to a second stage just outside the amphitheater, Paisley brought Carrie Underwood in to duet with him on “Remind Me” via a segment made to look like FaceTime. Utilizing a recorded vignette in the middle of a live performance has a strong potential to go awry and be horrifically cheesy, but Paisley pulled it off with aplomb and the audience loved it. After returning to the main stage, Paisley brought a pint-sized fan on stage to play “Mario Kart” on the giant video screen as he and his band tore through a rapid-fire take of the instrumental “The Nervous Breakdown.” He closed his main set with the party anthem “Crushin’ It,” featuring even more vicious solos and an hilarious video starring Paisley-drawn caricatures of nearly every current country star as some sort of superhero. He ended his encore with “Alcohol,” a humorous take on the pros and cons of imbibing, that ended the show on a positive note for fans. Second opener Justin Moore was nearly as well received as Paisley. His 50-minute set had the bulk of the audience stoked, from the anti-city boy “Bait a Hook” to the dedicated-to-the-troops ballad “If Heaven Wasn’t So Far Away.” His performance of “Small Town Throwdown” was received rapturously, and his reappearance later in the night received a massive ovation. First opener Mickey Guyton played a brief, politely-received set of pop-country that showcased her solid vocal chops. Jim Shahen is a freelance writer from Delmar.